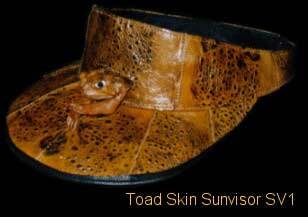 Marino Leather Exports produce high quality, handcrafted, wholesale cane toad novelties for the Australian souvenirs market. Our cane toad wholesale souvenirs are both original and unique. Cane toad novelties also make unique and unusual gifts. 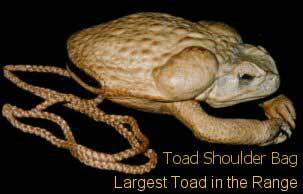 The cane toad (Bufo Marinus) was introduced to Australia from Hawaii in 1935 to combat the sugar cane beetle which was destroying the sugar cane crops. It has since over-populated the land to which it was introduced and is presently considered a major pest and threat to native wildlife. When you buy a cane toad product you are helping to save native fauna. These wholesale souvenir leather products help keep the cane toad population down. 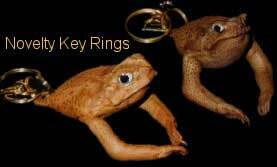 Because we manufacture these unique cane toad products, we are able to offer wholesale prices to the market. If you are an Australian souvenir retailer, our cane toad products will undoubtedly add to your range of products as they are ever-popular with international guest and locals alike. 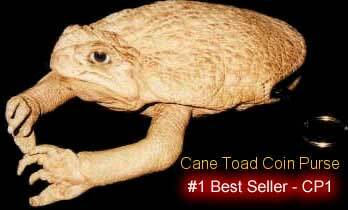 To qualify for our cane toad product wholesale prices, a minimum purchase of A$100 is required. We accept payment by Direct Deposit, Telegraphic Transfer, Western Union, Paypal and Cheques (must be cleared prior to dispatch). To apply, contact us at the Toad Factory. Our entire range of Australian souvenirs is individually handcrafted and manufactured from genuine cane toads under strict quality control. Cane toads are classed as major environmental pests in Australia and because they are not indigenous, no permits are required to send these Australian souvenirs overseas. Our Australian souvenirs come with information cards and are proven market sellers. Freight costs are low because the products do not weigh much and they are easy to post overseas. Click here to contact us for more information, or to access our cane toad products wholesale range. * To qualify for wholesale prices a minimum purchase of A$100 is required. We accept payment by Direct Deposit, Telegraphic Transfer, Western Union, Paypal and Cheques (must be cleared prior to dispatch).